Amedeo Chieregatoro has been crowned the WPT National Venice champion after topping a 330-runner field earlier this week. 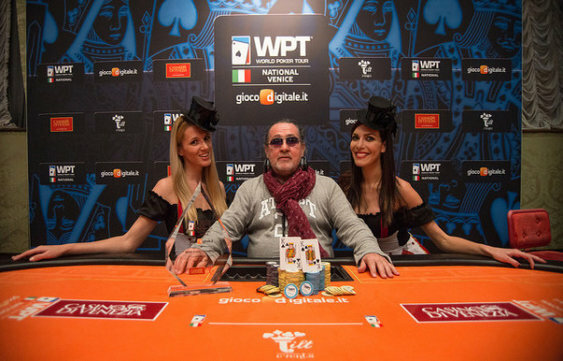 The Italian veteran pocketed a first prize of €65,000 after outlasting a top class final table that included WPT Champions Club member Andrea Dato and Max Pescatori. It was past midnight by the time Chieregatoro sealed victory over heads up opponent Pierangelo Cancian. In the end it took a cooler to separate them. Cancian pushed with AhJd but was unlucky enough to walk into pocket kings. The queen high board helped neither player which gave Chieregatoro the title and his biggest live score to date. The WPT National Series moves closer to home for its next stop with Aspers Casino in Newcastle the venue for the latest event. WPT National Newcastle takes place from Thursday 30 April to Sunday 3 May and has a buy-in of £200. It will be played using the Accumulator format meaning players can combine their chips from each day if they make it through to day two.